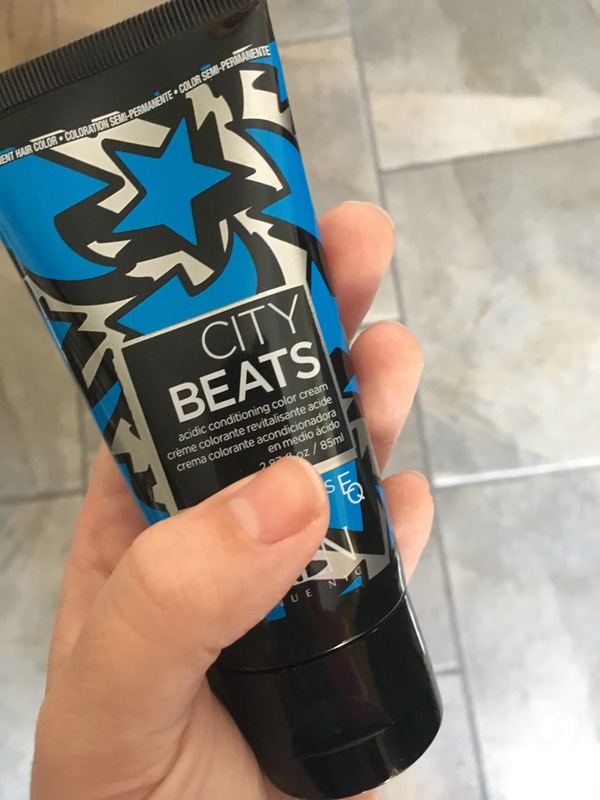 I finally got to use Redken CityBeats today. I’d been hoping for an opportunity to play with it for a few months now, and today that chance finally came! I used the Brooklyn Blue on a client who is going gray. His hair is a natural level 8 with some grays throughout, and some areas are whiter than others (like right at the sideburns). We wanted to put the color directly on his natural color so that there would still be some dimension, and so that it would be a quicker process. We put the color on and let it sit about 15 minutes. I forgot to wear gloves while applying the color. After lots of scrubbing, my hand is still very blue. This color works FAST, which is great on hair, but not so great on skin or clothes. Make sure to clean up messes fast if you use this! The color turned out so fun! It’s very bright on the naturally white sections, and this really cool silvery-blue on the natural level 8 parts. I love the dimension of having applied it to the natural hair without evening it out to one color beforehand. Overall, the color turned out very bright and exactly like I hoped it would. It worked quickly and was super simple to apply. I’m definitely going to keep it on hand for future colors. I am so happy to have you here! This blog has been something I’ve felt called to for quite some time, and I am glad to finally present it to you all. For those who don’t know me, my name is Lara and I am a hairdresser. I was the little girl who cut her own hair, her friend’s hair, her cousin’s hair… Basically any hair I could get my hands on! Instead of learning my lesson there, I decided to embrace my passion and now get to spend every day playing and loving life. My plans for the blog are to bring product reviews of both professional + drug store brands, as well as trends, tips + tricks to not just beauty professionals, but also the everyday person who may be unfamiliar with the industry. I’d love to hear from all of you and share what it is you want to see, so please leave some feedback in the comments on what you’re hoping for here. I’m so glad to be starting this journey with you all! Author hairbylaraPosted on March 23, 2017 March 23, 2017 Categories Personal PostTags intro, laraslifeLeave a comment on Welcome!